What would be the electron dot structure of carbon dioxide which has the formula CO2? How many structural isomers can you draw for pentane? Three structural isomers are possible for pentane. What are the two properties of carbon which lead to the huge number of carbon compounds we see around us? (i) Catenation − It is the ability to form bonds with other atoms of carbon. (ii) Tetravalency − With the valency of four, carbon is capable of bonding with four other atoms. What will be the formula and electron dot structure of cyclopentane? The formula for cyclopentane is C5H10. Its electron dot structure is given below. Draw the structures for the following compounds. *Are structural isomers possible for bromopentane? (ii) There are many structural isomers possible for bromopentane. 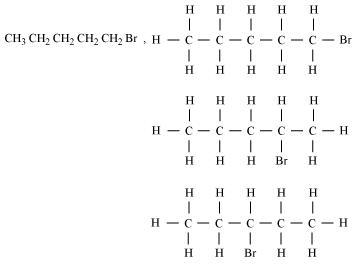 Among them, the structures of three isomers are given. How would you name the following compounds? Why is the conversion of ethanol to ethanoic acid an oxidation reaction? Since the conversion of ethanol to ethanoic acid involves the addition of oxygen to ethanol, it is an oxidation reaction. A mixture of oxygen and ethyne is burnt for welding. Can you tell why a mixture of ethyne and air is not used? When ethyne is burnt in air, it gives a sooty flame. This is due to incomplete combustion caused by limited supply of air. However, if ethyne is burnt with oxygen, it gives a clean flame with temperature 3000°C because of complete combustion. This oxy-acetylene flame is used for welding. It is not possible to attain such a high temperature without mixing oxygen. This is the reason why a mixture of ethyne and air is not used. How would you distinguish experimentally between an alcohol and a carboxylic acid? We can distinguish between an alcohol and a carboxylic acid on the basis of their reaction with carbonates and hydrogen carbonates. Acid reacts with carbonate and hydrogen carbonate to evolve CO2 gas that turns lime water milky. Alcohols, on the other hand, do not react with carbonates and hydrogen carbonates. Some substances such as alkaline potassium permanganate and acidified potassium dichromate are capable of adding oxygen to others. These are known as oxidising agents. Would you be able to check if water is hard by using a detergent? Detergents are ammonium or sulphonate salts of long chain carboxylic acids. Unlike soap, they do not react with calcium and magnesium ions present in hard water to form scum. They give a good amount of lather irrespective of whether the water is hard or soft. This means that detergents can be used in both soft and hard water. Therefore, it cannot be used to check whether the water is hard or not. People use a variety of methods to wash clothes. Usually after adding the soap, they ‘beat’ the clothes on a stone, or beat it with a paddle, scrub with a brush or the mixture is agitated in a washing machine. Why is agitation necessary to get clean clothes? A soap molecule has two parts namely hydrophobic and hydrophilic. With the help of these, it attaches to the grease or dirt particle and forms a cluster called micelle. These micelles remain suspended as a colloid. To remove these micelles (entrapping the dirt), it is necessary to agitate clothes. 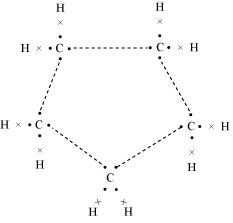 (b) Ethane has 7 covalent bonds. (c) The functional group of butanone is ketone. (a) the food is not cooked completely. (b) the fuel is not burning completely. (c) the fuel is wet. (d) the fuel is burning completely. (b) While cooking, if the bottom of the vessel is getting blackened on the outside, then it means that the fuel is not burning completely. Explain the nature of the covalent bond using the bond formation in CH3Cl. Carbon can neither lose four of its electrons nor gain four electrons as both the processes require extra amount of energy and would make the system unstable. Therefore, it completes its octet by sharing its four electrons with other carbon atoms or with atoms of other elements. The bonds that are formed by sharing electrons are known as covalent bonds. In covalent bonding, both the atoms share the valence electrons, i.e., the shared electrons belong to the valence shells of both the atoms. Here, carbon requires 4 electrons to complete its octet, while each hydrogen atom requires one electron to complete its duplet. Also, chlorine requires an electron to complete the octet. Therefore, all of these share the electrons and as a result, carbon forms 3 bonds with hydrogen and one with chlorine. What is a homologous series? Explain with an example. A homologous series is a series of carbon compounds that have different numbers of carbon atoms but contain the same functional group. For example, methane, ethane, propane, butane, etc. are all part of the alkane homologous series. The general formula of this series is CnH2n+2. It can be noticed that there is a difference of −CH2 unit between each successive compound. How can ethanol and ethanoic acid be differentiated on the basis of their physical and chemical properties? • Ethanol is a liquid at room temperature with a pleasant odour while ethanoic acid has vinegar-like smell. The melting point of ethanoic acid is 17°C. This is below room temperature and hence, it freezes during winters. • Ethanoic acid reacts with metal carbonates and metal hydrogencarbonates to form salt, water, and carbon dioxide gas while ethanol does not react with them. Why does micelle formation take place when soap is added to water? Will a micelle be formed in other solvents such as ethanol also? A soap is a sodium or potassium salt of long chain fatty acids. It has one polar end and one non-polar end. The polar end is hydrophilic in nature i.e., this end is attracted towards water. The non-polar end is hydrophobic but lipophilic, i.e., it is attracted towards hydrocarbons. When soap is added to water, soap molecules arrange themselves in a cluster to keep the non-polar portion out of water such that the non-polar ends are in the interior of the cluster and the polar ends are on the surface of the cluster. Since the dirt present on clothes is organic in nature and insoluble in water, the hydrophobic ends of the clusters attach themselves to the dirt. This cluster formation in which the dirt is entrapped is the micelle. Micelle formation does not occur in alcohol because the alkyl chain of soap becomes soluble in alcohol. Why are carbon and its compounds used as fuels for most applications? Most of the carbon compounds give a lot of heat and light when burnt in air. Saturated hydrocarbons burn with a clean flame and no smoke is produced. The carbon compounds, used as a fuel, have high calorific values. Therefore, carbon and its compounds are used as fuels for most applications. Explain the formation of scum when hard water is treated with soap. Soap does not work properly when the water is hard. A soap is a sodium or potassium salt of long chain fatty acids. Hard water contains salts of calcium and magnesium. When soap is added to hard water, calcium and magnesium ions present in water displace sodium or potassium ions from the soap molecules forming an insoluble substance called scum. A lot of soap is wasted in the process. What change will you observe if you test soap with litmus paper (red and blue)? Since soap is basic in nature, it will turn red litmus blue. However, the colour of blue litmus will remain blue. What is hydrogenation? What is its industrial application? Hydrogenation is the process of addition of hydrogen. Unsaturated hydrocarbons are added with hydrogen in the presence of palladium and nickel catalysts to give saturated hydrocarbons. This reaction is applied in the hydrogenation of vegetables oils, which contain long chains of unsaturated carbons. C2H6, C3H8, C3H6, C2H2 and CH4. Unsaturated hydrocarbons undergo addition reactions. Being unsaturated hydrocarbons, C3H6 and C2H2 undergo addition reactions. Give a test that can be used to differentiate chemically between butter and cooking oil. Butter contains saturated fats. Therefore, it cannot be hydrogenated. On the other hand, oil has unsaturated fats. That is why it can be hydrogenated to saturated fats (solids). Explain the mechanism of the cleaning action of soaps. The dirt present on clothes is organic in nature and insoluble in water. Therefore, it cannot be removed by only washing with water. When soap is dissolved in water, its hydrophobic ends attach themselves to the dirt and remove it from the cloth. Then, the molecules of soap arrange themselves in micelle formation and trap the dirt at the centre of the cluster. 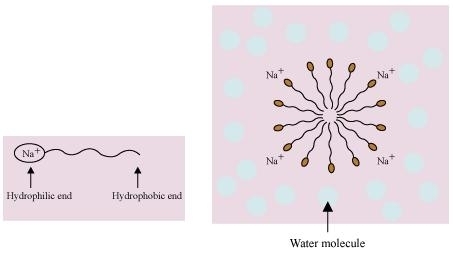 These micelles remain suspended in the water. Hence, the dust particles are easily rinsed away by water.